Free Lyrics Finder can download lyrics for your songs in MP3, FLAC, APE, OGG, and other popular formats automatically. Just open the folder containing your songs, press Ctrl + A to select all songs and click the "Find lyrics" button on the toolbar. Free Lyrics Finder will look up lyrics for the selected songs using information from their tags or filenames. This will open the settings window of Free Lyrics Finder. There are several tabs, with the "General" tab selected. Built-in player. This is used by default. As you start playing a song with the built-in player, a small track bar appears on the toolbar, allowing you to set playing position easily. Winamp. Winamp is one of the most popular media players for Windows, now discontinued. If you have it installed, select this option, and Free Lyrics Finder will automatically detect the path to the executable file of Winamp. If it fails to do so, you can select the correct path manually using the controls that appear below the options. External Windows player. If you select this option, the default Windows association will be used. For example, if you have MP3 files associated with Windows Media Player, FLAC with Winamp, etc., the corresponding player will start for each file type (thus, with different formats, you may have different players). 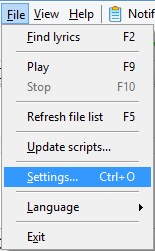 The default player is the player that starts when you double click a file of the given type in Windows Explorer. This option does not require any additional adjustments. Custom player. This option allows using any media player. Furthermore, you can specify commandline parameters to start the player in the desired configuration. To use a custom player, click the "..." button next to the path field and select the main executable file (.exe) of the player. Any commandline parameters are optional. If you are not sure what should be entered, just do not change anything in the path field manually. After selecting your preferred option, click "OK" to save the settings and close the window. Now, when you click the "Play" button, the selected media player will start playing the selected song.